Since 1977, Alt Rejser has arrange travels to once known as the Soveit Union / currently known as Russia. We at Alt Rejser are expert in all forms of travel tours be it an individual or group travel. We are multiligual and ready to advice you regarding hotels, itenirary etc. Visa is also certainly our area of expertise. 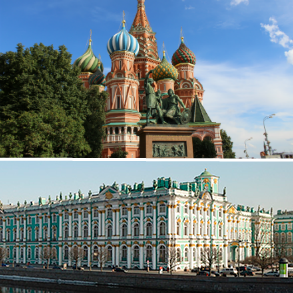 Additionaly, we also arrange customize individual and group tours - so do not hesitate to call us if you would like to travel in Russia and your travel itinerray does not match the travel packages we offer below. We will provide you a price offer that perfectly match your choice of journey. "Russia can not be grasped by the mind ..." says the Russian author, Fjodor Tjuttjev. It is true: Russia in many ways is unimaginable. You cannot simply imagine the country out from a story. You have to experience it! You have to hear the blaring snow under your boots while you breath the clear frosty air and listen to the church bells ringing and get blinded by the golden domes that glitters under the sun's rays. One must roll through the huge glass halls in the palaces or be completely taken away by the colorful and celar water sea, that reflects the glass buildings in one of the world's wildest metropolis. To get a sense of the vast steps of the world's largest country, it is best to travel accross Siberia with the legendary Trans-Siberian Railway. Sailing through Russia's rivers is also a good way to come closer to the many small cities and the beautiful nature - all the way to the mysterious Karelien i Nord over “The Golden Rings” excitng small cities with varities of churches and monasteries of the Middle Ages and down to southern Russia's remarkably exotic cities. To complete your experience, you must go totally over the icy Kamtjatka and down in the wild Kaukasus mountain.